Once, I absent-mindedly tipped a teaspoon of coffee into a mug that already contained a teabag. If I was a more curious and adventurous person, I’d then have filled the mug with boiling water and drunk the mixture, just to find out what coff-tea tasted like. As I’m a less curious and adventurous one, I emptied out the coffee granules, dusted off the teabag and started again. I remember an older child in my Reception class at primary school snatching my latest picture of a house and garden and showing me how to create pink flowers by merging red and white wax crayon. I was amazed and delighted—but wondered why I hadn’t been able to discover this marvel for myself. Thankfully, there are plenty of other people in the world with the imagination required to think of new ways to mix things up (and the sense to know when their combinations will be beneficial and when they’ll be revolting or downright dangerous). This is the art—or the science—of the perfumer, the wine blender and the materials engineer, among many others. Without them, we wouldn’t have the classic scent accord of rose and jasmine, or the supremely delicious cocktail of champagne and cassis, or carbon-ceramic brakes. Creative as these examples are, they can’t beat some of the jaw-droppingly surprising mixtures found in the natural world. Who could imagine that two invisible gases, hydrogen and oxygen, would bond to produce something so completely ‘other’ as liquid water—different to see, hear, touch and taste? It seems quite ridiculous, too, that the seven vibrant colours of the rainbow should blend to make ‘pure’ white light. There is both artistic flair and scientific precision involved in creating a mixture of elements that is fresh, innovative and worthwhile (and I know I’ve said something like this before: see Art and craft and engineering.) Television presenter James May makes the point well: ‘Technology and artistry are connected by a piece of elastic that is infinitely stretchy, so they can end up a very long way apart, but it never actually breaks’ (Essential Classics, BBC Radio 3, 30 December 2014). I wonder if this is one of the things that keeps arts and sciences together on that stretchy continuum—that they share an interest in seeking out new combinations to enhance our lives with beauty and usefulness. 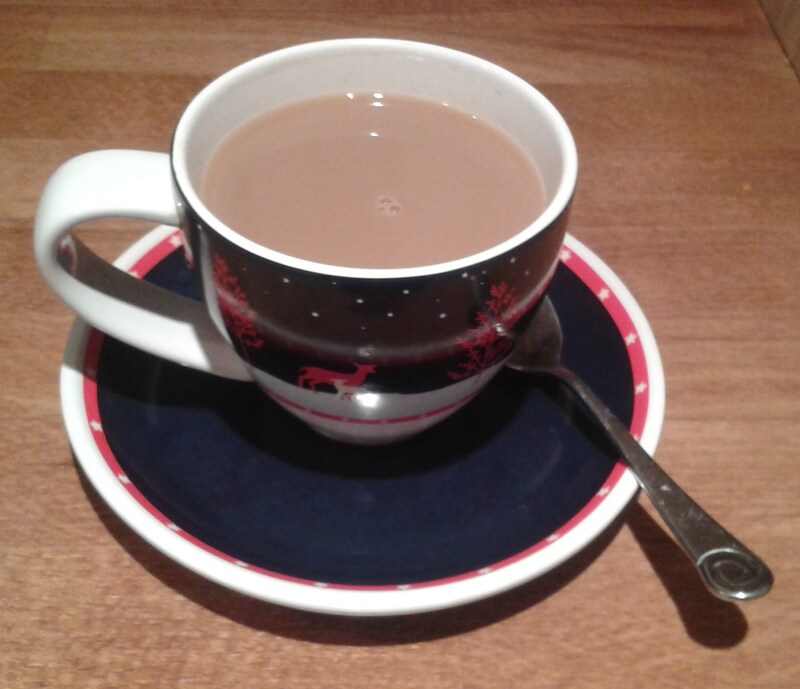 Perhaps it’s not surprising that, in writing this post, I’ve whetted my own curiosity about what a tea/coffee combo would taste like. So I’ve made it—deliberately this time, not accidentally—and it’s not at all bad. But, to be honest, I’d rather have a Kir Royale. This entry was posted in Uncategorized and tagged art, cocktail, mixtures, perfume, science, technology. Bookmark the permalink.